A Zone dedicated to exploring the impact of industry on the Muskoka landscape and the life that inhabits it. Projects are designed to both celebrate humanity’s industriousness, and to consider how it shapes your life. Come play in the sand box! 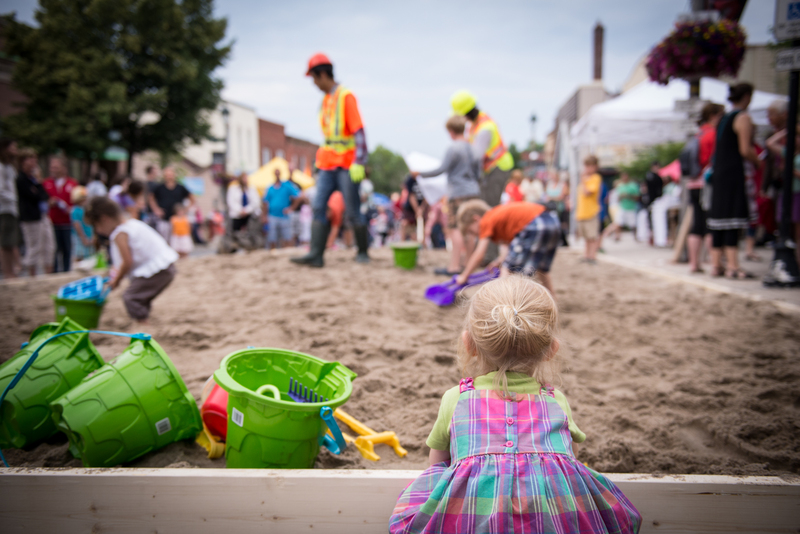 A section of Main St. will be covered by Hutcheson Gravel’s world famous sand. Tools will be on site for you to create your own sculptures. Dig, bury, or build, but hurry up as these masterpieces will only live for a short period of time. Every 30 minutes, our head contractors Helen Donnelly and Manuel Rodriguez will blow the whistle blast to signal the demolition of these structures as you can run through the area smashing, stomping and destroying the creations. Once this mayhem has subsided, the playing area will be raked and made ready for new creations to emerge. A playful exploration of the temporary nature of our creations, and how time will constantly lay our work bare in order to start over again. A giant sculpture made of wood and wound branches towers above you evoking conflicts of the past and contradictions of the foundations we rely on today. Inspired by the successive settlements which happened in the Muskoka area and the resulting depletion of pine trees that took place between 1900 and 1910, a tall 4 sided chamber hangs high above ground representing the audacity of builders in challenging nature itself. A linear second structure evoking a tree trunk colliding diagonally, symbolizes the last tree which is challenging the human to use of it. Created by festival favorite Marc Walter (creator of Big Tom, The Bridge and Land Wear the Nomads) this sculpture will be in creation in the week leading up Nuit Blanche North outside of Trinity United Church. Drop by, meet the artist, and participate in its creation. EEGDynamixx in association with BEnt. brings you HARPPP: an interactive sound installation for receiving and transmitting messages through the earth energy grid. Building on his continuing explorations of his NETTT formations, artist Rob Gill uses an array of vertical copper pipes to create an intricate grid which is in part a satire of, in part a serious aprehension of the actual HAARP(High Frequency Active Auroral Research Program) installation near Anchorage Alaska. 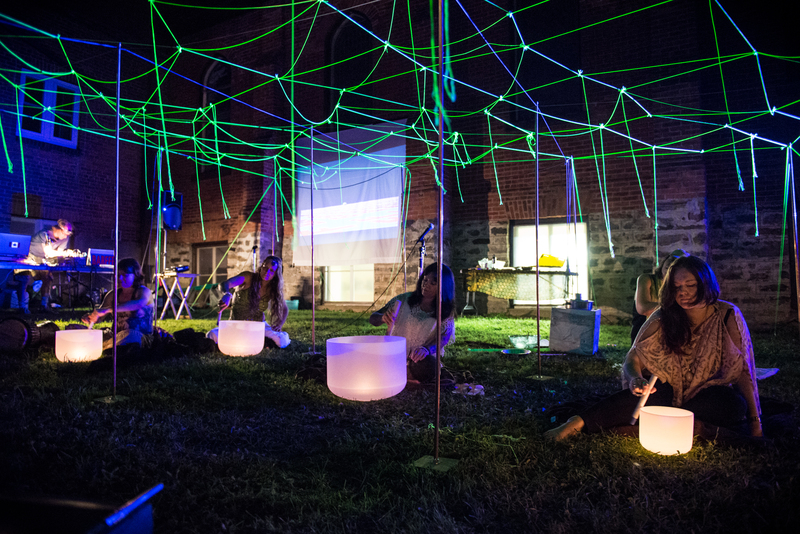 Come walk through the web and strum the wires whose sound will be recorded, and mixed together into a collective soundscape to be transmitted along the earth energy grid. If alien spaceships land and say hello then we know it has worked. “Bird flies at the window, death knocks at the door”. An omen of death from the Victorian era that is still widely shared in our society today. “Omen” is a two-person performance piece that explores this occurrence and our physical reaction to it. 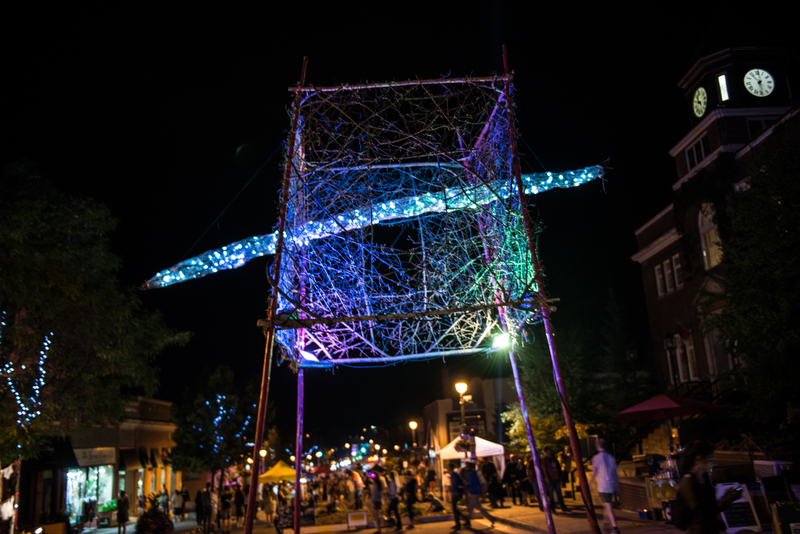 A collaboration between dancer and choreographer, Sarah Kernohan (Bracebridge) and visual artist, Miranda Britton (Windermere), “Omen” is a performance that travels throughout Huntsville’s downtown throughout the evening. 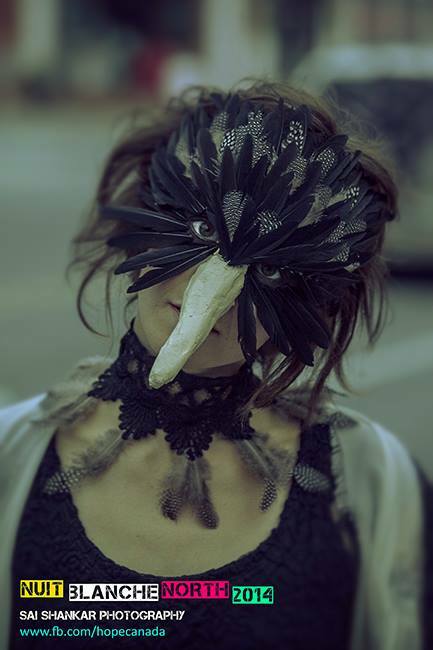 Clothed in stylized bird costumes, the two performers interact with the built environment,“flying” towards buildings and either “impacting” or having near misses, and occasionally leaving handmade feathers behind as a memory of the moment of impact. First on the Dial, Hunter’s Bay Radio presents some of the finest musical talent Muskoka has to offer in the Algonquin Theatre’s licensed performance space. Come in, grab a seat and a cold one, and enjoy the sounds as HBR takes you live to air. Enter into a world of light, shadow and whimsy. 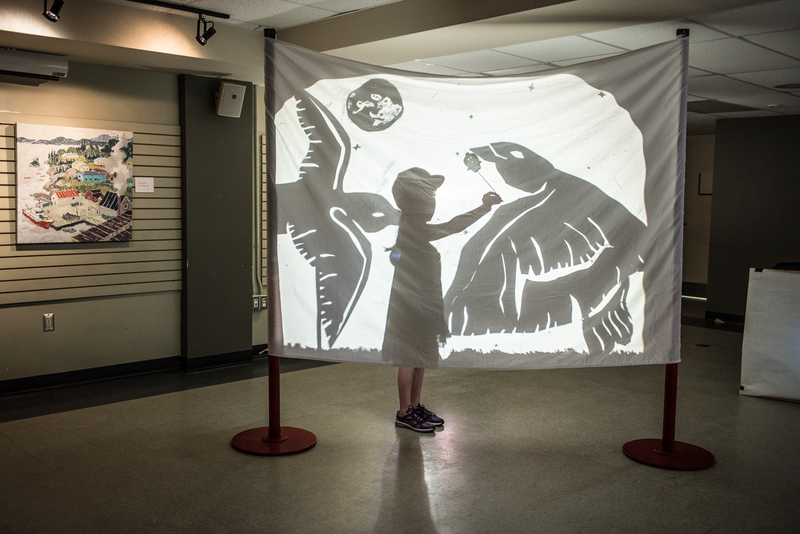 Using simple materials, a variety of lights and projection surfaces, you can create your own shadow puppets. Create characters, tell a story or just explore. 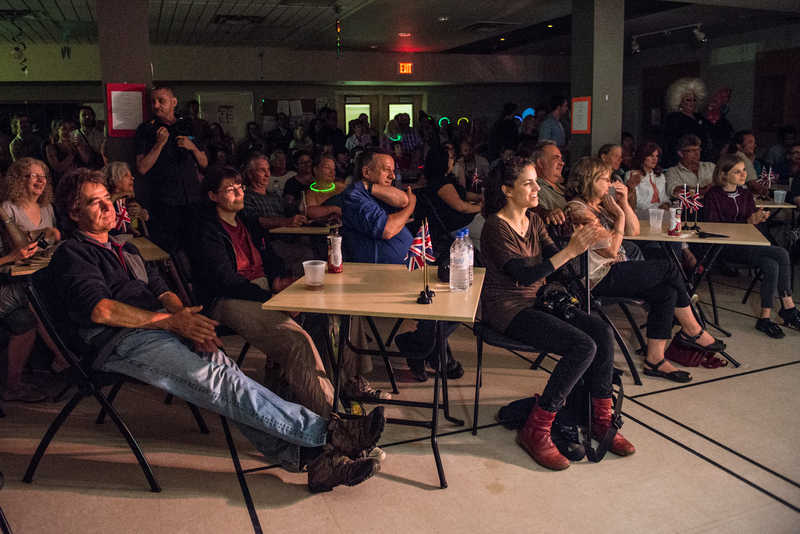 Artists will be there with friendly help and advice as you explore a canvas of light and dark.